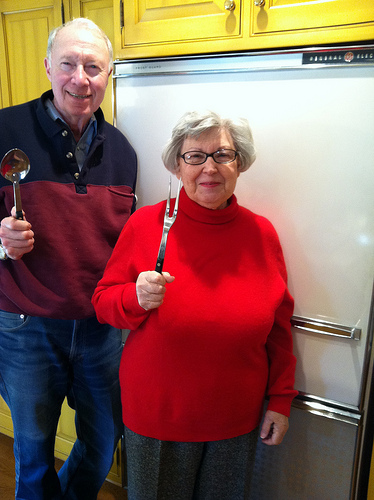 My mom and dad just celebrated 57 years of marriage and the 50th anniversary of their GE refrigerator. When I walk into their kitchen, it’s like taking a step back in time. Besides the hum of that old fridge (and no, it is not energy efficient), my mom’s home-cooked meals are essentially the same as the ones I ate as a kid. They are simple yet satisfying; no recipe required. My parents pose proudly in front of their antique fridge! 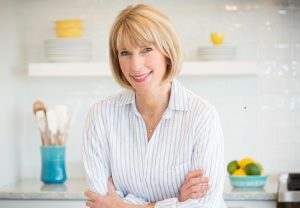 In today’s world of TV cooking shows, food blogs, celebrity chefs, and glossy cookbooks, my mom relies on a few yet flavorful ingredients – meat from her local butcher, seafood from the local fish market, fresh and dried fruit, and lots of veggies and aromatics. 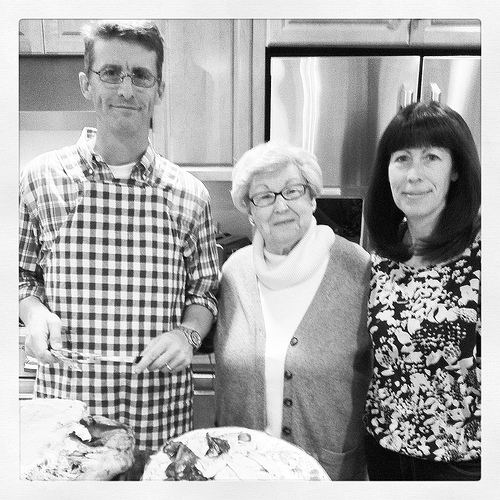 My mom at this year’s Thanksgiving feast with my husband, Tim – the official turkey carver — and my sister, Amy. Keep Things Simple: I love trying out new recipes. In fact, I have more cookbooks than I know what to do with. But at the end of the day, the favorite meals in my household are throwbacks to what I enjoyed as a kid. One of those dishes is a baked ziti my mom invented made with ground beef and lots of mozzarella cheese. My makeover version, which I affectionately call Mama’s Amazing Ziti, is still hearty but it’s made with lighter ingredients like lean ground beef and part-skim cheese, and I toss in some shredded carrots for good measure. 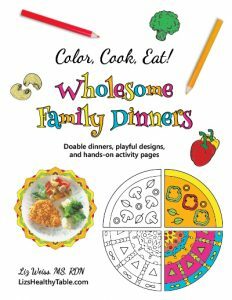 Fruits and Vegetables with Every Meal: My mother has always been a big proponent of fruits and vegetables. And as the old saying goes, the apple doesn’t fall far from the tree … so I too make a point of having lots of produce on my family table. I realize vegetables can be a tough sell for some kids, so I make an effort to add bright flavors to veggies and I’m always mindful of textures. My mom loves to sauté zucchini, onions, and summer squash, which is a bit too mushy for my son, Josh. Instead, I like to sauté baby spinach in evoo and then sprinkle with kosher salt; it’s always a huge hit. 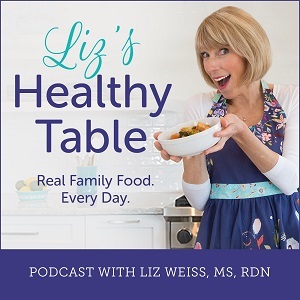 Enjoy Your Time in the Kitchen: For all the years I’ve hung out at my mother’s apron strings, I never once heard her complain about cooking or the time it took to get a meal on the table. She’s organized, keeps ingredients to a minimum, and always makes enough so there are leftovers. My dad is a well fed guy! She is big on brisket, stews, and soups and never hesitates to send my dad outside to fire up the grill. It’s no wonder I love stews and soups, but as a working mom, I turn to my slow cooker whenever I can. (My mom has never touched one.) Pulled Pork Primavera sandwiches is one of those recipes my kids ask for over and over again. 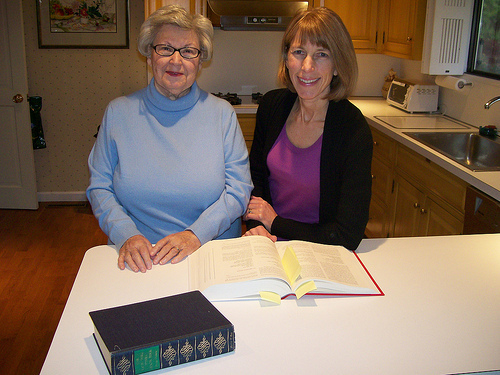 Hanging out with my mom in her kitchen with the New York Times Cookbook. Wishing everyone a happy Mother’s Day. 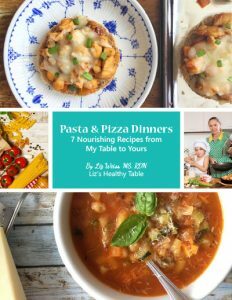 Now get into the kitchen and get cooking!